Surgery may be recommended if conservative treatment options such as anti-inflammatory medications and physical therapy do not relieve the symptoms. During the procedure, a surgical cut is made over the hip to expose the hip joint and the femur is dislocated from the acetabulum. The surface of the socket is cleaned and the damaged or arthritic bone is removed using a reamer. The acetabular component is inserted into the socket using screws or occasionally bone cement. A liner made of plastic, ceramic or metal is placed inside the acetabular component. The femur or thigh bone is then prepared by removing the arthritic bone using special instruments, to exactly fit the new metal femoral component. The femoral component is then inserted into the femur either by a press fit or using bone cement. Keep a pillow between your legs while sleeping for the first 6 weeks. Never cross your legs and bend your hips past a right angle (90). Avoid bending down to pick up things, instead a grabber can be used to do so. 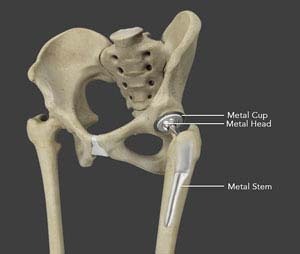 Total hip replacement is one of the most successful orthopedic procedures performed for patients with hip arthritis. This procedure can relieve pain, restore function, improve your movement at work and play, and provide you with a better quality of life.